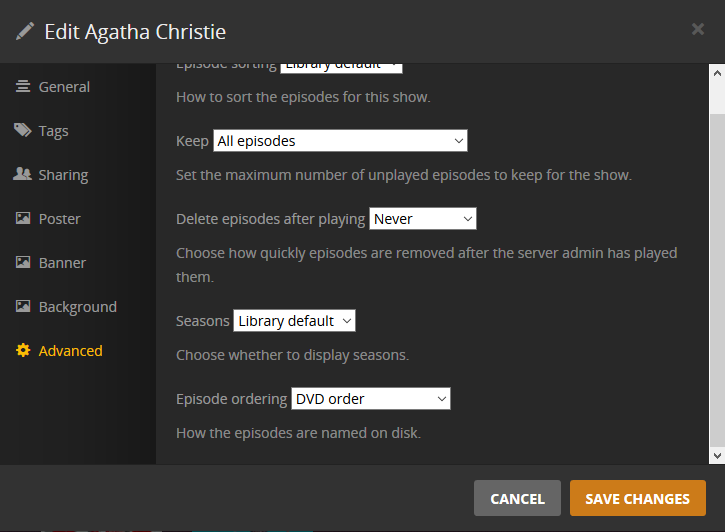 please add Agatha Christie's Poirot DVD order. How do you know? The few episodes I checked have a DVD order. I recently received the Poirot "Complete Cases Collection" with all 70 episodes in broadcast order. Season 3 has a total of 11 episodes but TVDB only shows 10 and they are out of order (https://www.thetvdb.com/series/agatha-c ... /seasons/3). The first episode is missing with episode 2 labeled as 1, 3 as 2, etc. IMDB has it correct (https://www.imdb.com/title/tt0094525/episodes?season=3). This is a problem as I placed the series on my Plex system and all but season 3 is shown as correct. You have season 3 locked so it cannot be corrected. It is not visible due to a bug, but available for scraping. Set your Plex to use DVD Order for this series by editing the option (pencil icon, advanced) as well as performing the requirements for Plex to find the files with the proper names if necessary. You are correct, here in TVDB it is shown as the 10th episode of Season (or Series as they call it) 2 but it is misplaced as it was actually the first episode of Season 3. It was first aired in 1990 but 6 months after the last episode of Season 2 (although 4 months before episode 2 of Season 3). Season 2 only had 9 episodes while Season 3 had 11. As I stated in my first post the complete set has it as S3E1 and so does IMDB. Season 2 only had 9 episodes while Season 3 had 11. And the problem is compounded because it not only doesn't have this episode in the right season but it has thrown all of the other episodes in Season 3 off so they do not display properly. The moderator (Maretoh) has it locked and needs to correct it so that Plex and any other user will have the correct info. Aired Order will not change. Use DVD Order. IMGUR album to help you figure this out even more. Name your files as you want them in your denied request, with the S2E10 file as S3E01, and then use the Plex DVD Order option. Problem solved.